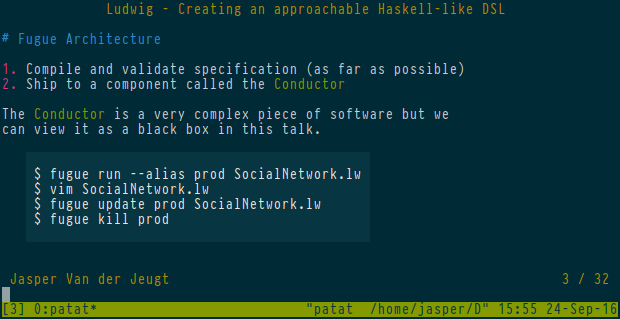 I don’t spend time worrying about layout, terminal stuff always looks cool. I want to write markdown if possible. Seamless switching between editor/shell and presentation using tmux. The last point is important for video conferencing especially. The software we use allows you to share a single window from your desktop. This is pretty neat if you have a multi-monitor setup. However, it does not play well with switching between a PDF viewer and a terminal. To this end, I wrote patat – Presentations And The ANSI Terminal – because I was not entirely happy with the available solutions. You can get it from Hackage: cabal install patat. The software I was using before contained some Markdown parsing bugs. By using Pandoc under the hood, this should not happen. Additionally, we get all the input formats Pandoc supports (Literate Haskell is of particular importance to me) and some additional elements like tables and definition lists. Most Markdown presentation tools seem to split slides at --- (horizontal rulers). This is a bit verbose since you usually start each slide with an h1 as well. patat will check if --- is used and if it’s not, it will split on h1s instead. If you run patat --watch presentation.md, patat will poll the file for changes and reload automatically. This is really handy when you are writing the presentation, I usually use it with split-pane in tmux. I started writing a simple prototype of patat during downtime at ICFP2016, when I discovered that MDP was not able to parse my presentation correctly. 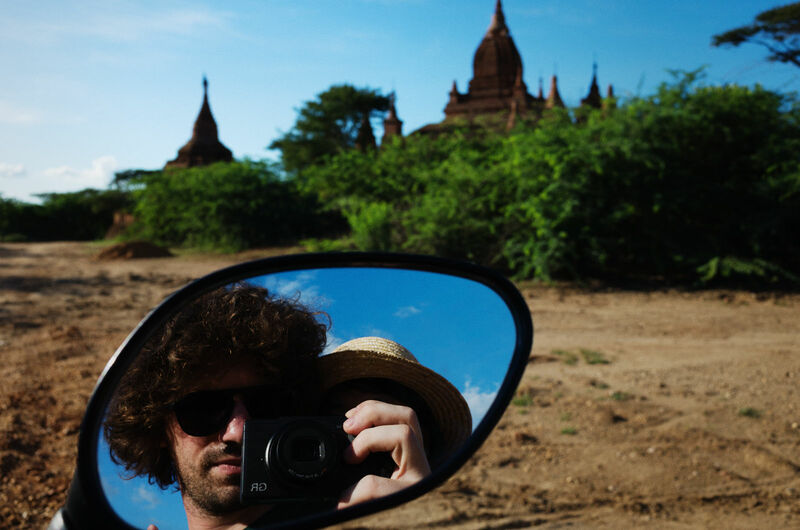 After ICFP, I flew to Myanmar, and I am currently traveling around the country with my girlfriend. It’s a super interesting place to visit, with a rich history. 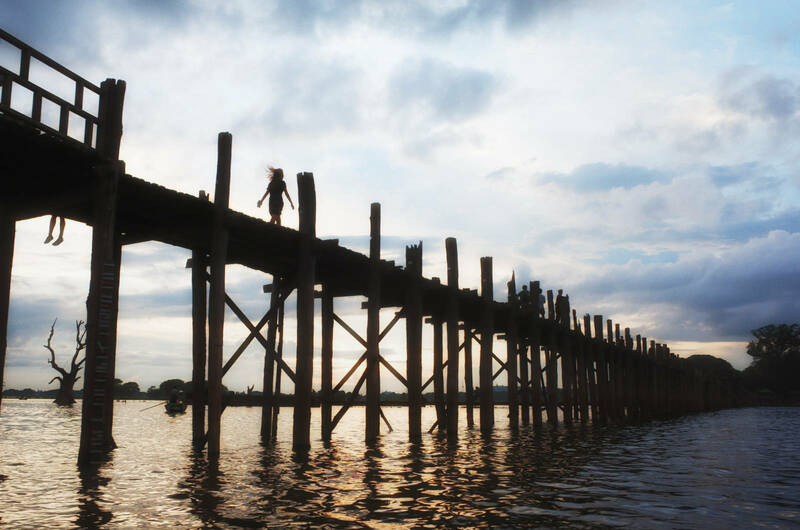 Now that NLD is the ruling party, I think it is a great time to visit the country responsibly. However, it is a huge country – the largest in south-east Asia – so there is some downtime traveling on domestic flights, buses and boats. I thought it was a good idea to improve the tool a bit further, since you don’t need internet to hack on this sort of thing. Pull requests are welcome as always! Note that I will be slow to respond: for the next three days I will be trekking from Kalaw to Inle Lake, so I have no connectivity (or electricity, for that matter). Sidenote: “Patat” is the Flemish word for “potato”. Dutch people also use it to refer to French Fries but I don’t really do that – in Belgium we just call fries “Frieten”.